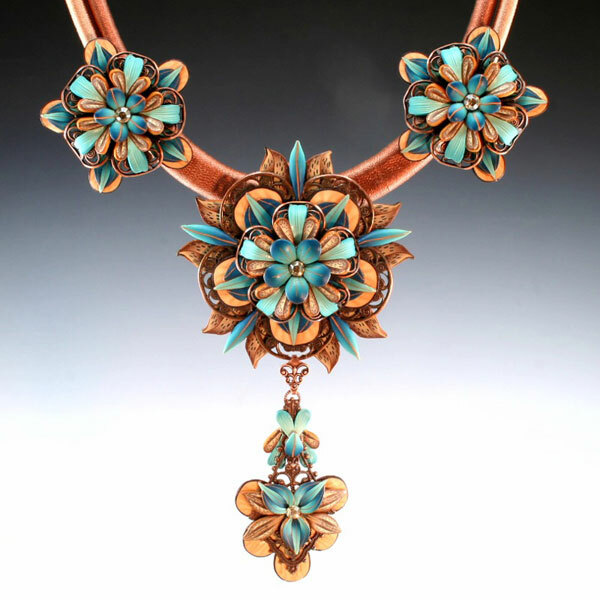 Lynne Ann Schwarzenberg, winner of the Bead Dreams 2010 top prize, sent in a picture of her winning entry. 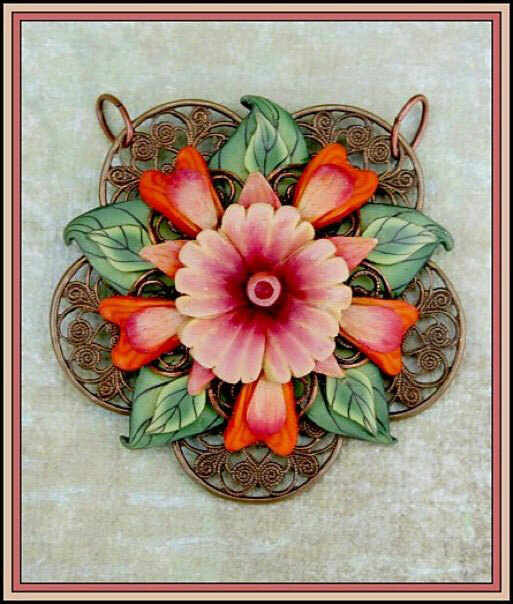 Lynne layers floral cane slices over filigree to achieve her “Beautiful Baroque” effect. You can see more recent examples of filigree work on her Facebook photo page. As Lynne tells it, “I discovered polymer clay in college, when a friend brought over a sampler pack of clay and wanted to make beads to sell as she traveled the country following her favorite band, the Grateful Dead. We made beads together that afternoon, and she left the clay at my apartment when she left on her trip. I was immediately taken by this wonderful, colorful substance, and it’s been a love affair ever since.” Have a lovely weekend. Love Lynne’s work. Hope someday to be as talented. Absolutely gorgeous work! Her tutorials are fantastic, too! Such talent! Her filigree fusions are to-die-for. Stunning work…so detailed and just plain beautiful! Congratulations to Lynne, Lludmya, and Janice on winning their Bead Dreams prizes. Beautiful work, ladies. I’ve taken one workshop with Lynne Ann. She’s a wonderful teacher. I think she’s found a great niche with these filigrees. Her florals complement them so beautifully. I drool at the thought of one of her new workshops using the filigrees. Congratulations to Lynne Anne! Her classes have brought my own artistry up quite a few notches. She is a talent in the PC field.